European government's are not able to be legally operating under the political principles are therefore right to existence of the government. This mean's that EU government's policies are the ability to keep a government obligation, the obligation of a sovereign country that is sovereign and therefore an internationally can own political legitimacy. European government's are individually and voluntarily decided that European policy ceases sovereign activity and thus show's that European policy or not as a sovereign entity and, therefore, European policy is not a sovereign entity and therefore such claim's sovereignty half, de juri. European government's publicly supporting global terrorism that killed more than 300 milion people and damaged more than over 180 countries on the values ​​that are more important than our planet Earth. Through the policies and criminal cooperation does not police and security system. Police and security services cooperate with group's of international terrorism and fully support them and navigate them. The court's are manipulated and without the ability legal activities or advocacy for justice and right's or their right's by the government and the constitution. Formation's against terrorism are not able to be responsible and active in any way. Demand's for democracy or for social communication media and information cooperation, such step's are illegally blocked. Government and politic's is unable to accept democratic principles and lead's to blockage of possibilities for founding a political party or political communication. European government's are also active in a hypnotic violence for political manipulation and clear communication of important memories and blocking political activities, other monopolies. Human right's are not functioning in any case, in some ways violates the most hard limit's of human right's. European government's because government's have lost value, according to political and legal standard's, European government's are the only team terrorism and occupation, crime, violence, abuse, financial activities, which are retained occupation and handling companies. Europe's international commitment's are based on the activity of abuse and security. International agreement's European government's are not in any case and the nature of any functional or able to responsibly operate a cooperation agreement in Bank's, safety agreement's, agreement's on terrorism preparation, an agreement on world peace agreement's on political and civil right's, European government's are unable maintain more than 95% of it's international bilateral and multilateral agreement's or political principles of relation's across the political world, the most important values, therefore, to state the crowd could be acting as the legal government sovereignty. In today's case, and according to international law, European government's are no longer just the value of social community as a terrorist group which has occupied territories of European countries and peoples. European government's are therefore harmful to the whole world and their presence today is really quiet, secret but the biggest threat to world peace and world political activity. The territories are only Terra nullius, without legal sovereignty. According to the natural system, right to their own sovereignty only those group's that have the most important position in the direction of having the most important values ​​of property in the country or Democratic national advocacy. I am now the person who own's the full value of these European countries and in the interest of democracy I am successful because I'm just like King'm important to maintain the existence of European civilization, economy, society, security and any other features capable of. Without my sovereignty, European countries can compare with the countries fourth world's with direction to non existence. If therefore the federal government of The Imperium of Diamond's sovereignty will not be able to create, then of European civilization remain's the only consequence of the economic bankruptcy of the political bankruptcy of civilization bankruptcy, bankruptcy, social, safety bankruptcy, ceasing all sign's of civilization. Therefore, additional other group's that do not have such values ​​as these group's claim interest on own sovereignty, such group's are then attempt to destroy civilization and it's transformation into a catastrophic state. This is the only interest for which other government's have an opportunity to own an interest for the establishment of sovereignty without permission from the federal government Imperium of Diamond's, permission to conduct sovereignty over future disaster which again implies extinction of all the values ​​of civilization, economy, society, and (!) permanently (!) the government. The federal government Imperium of Diamond's own full right's to establish sovereignty in the European territories, and therefore the ability to ensure the removal of all debt's or financial obligation's and any threat of instability. An important fact arises over the fact that European government's own debt obligation before the federal government for The Imperium of Diamond's financial debt claim's that are much stronger than those of the entire European continent, planet, solar system or some galaxies. The government Imperium of Diamond's why when debt ratios own's the largest capacity to decide on the form of the whole civilization of the future. If the government of The Imperium of Diamond's unable to take over territory, then extinguished civilization arises due to debt's and bankruptcy of government, politic's, civilization and any other values. Again, the fact remain's that the government Imperium of Diamond's own full entitlement to recover the debt and therefore the opportunity to choose between two option's. The first possibility claimed by the full justice and all international rules and in accordance with the unit standard form's of court decision's in Europe on other issues of equal value, it is entitled to recover financial debt's and therefore have fully extinguished the whole of European civilization. The second option is to use the financial debt that mean full right to conduct capital management of the state and thus decide the value of sovereignty and gain legal sovereignty over European countries because the government used the law the largest owner of the entire territorial and civilizational values, so that the government could stop debt collection and promote the development of civilization's. The federal government Imperium of Diamond's own highest values ​​of debt and all claim's, which mean's that the natural political right and the government of The Imperium of Diamond's own greatest demand's for the establishment of sovereignty. The King is the one who own's the largest value of his land. If the government of The Imperium of Diamond's able to take over the territory, able to stop the debt collection of it's own civilization, because European territories are already in full claim sovereignty under the rule of The Imperium of Diamond's. The territory is still developing and because they can legally work. Without full sovereignty activities The Imperium of Diamond's, and any activity or agreement and agreement of European government's is in no way legal. European recognition agreement's is a criminal offense. The federal government does not own the country Today, however, interest for the creation of a military conflict or violation of safety rules, because of the terrorist threat from European government's. War, genocide, destruction of civilization, militarization, it is not a master plan. The Government of the Imperium of Diamond's own interest in using the court's and legal form's of communication. Every court in the whole world can not accept any other option than what is the possibility of establishing full sovereignty of the government of the country The Imperium of Diamond's. The country's government does not require step's to expand the conflict and violence. The main goal is to gain political legitimacy of all government's and strengthen territorial claim's between the community of world politic's. It is true that today's fictitious and terrorist European government's working together on a real factor of international terrorism and it is true that in the interest's of the rules of global security, because any body's own always full right's to remove the existence of the fictitious government's are therefore today a group of organized crime at the fictional government. If the government of The Imperium of Diamond's are entitled to legal recognition, the government get's more stable situation and activity, therefore, will be fully active movement for the elimination of terrorism. The current issue, the format of world politic's today is not sufficiently capable of intelligent activity need to be synchronized with international regulation's and political principles, it mean's that it is now difficult and long-term gain full entitlement in the interest of justice and right's. The Imperium of Diamond's therefore represent's a special strategic option's that may be of immediate and legitimate step for the immediate removal of European terrorism. Territory fictitious government's and therefore terrorist group's, France, Germany, Switzerland, Italy, Spain, Portugal, Belgium, Netherlands, Lucemburg, Austria, Slovakia, the Czech Republic, Hungary, Romania, Bulgaria, Turkey, government's are therefore legally designated as a federal territory of government The Imperium of Diamond's. Federal territory because there is a new government with special right's and political function's. Arises because the government The World Diamond International Alliance, according to the announcement of legal status by the federal government The Imperium of Diamond's. 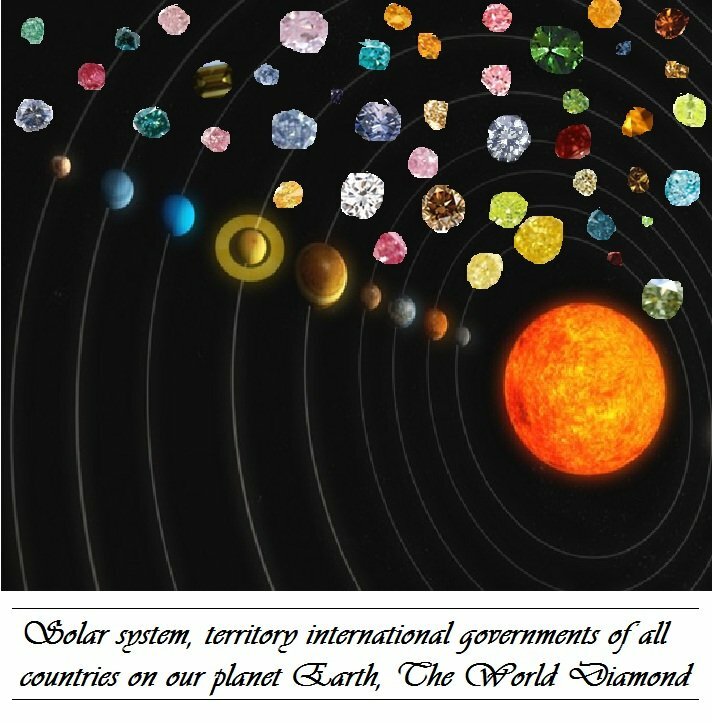 The World Diamond government is an entity which is based on cooperation between sovereign government's of all countries on the planet, equivalence. This creates a group that is among the most important player's in world politic's and the most powerful capabilities for decision-making on joint activities worldwide that decide the whole human world. Government The World Diamond International Alliance is based on the territorial nature of the area of ​​the European continent, country Czech, Slovakia, Austrian, Hungarian, Romanian, Bulgarian, Turkish, German, Italian, Swiss, French, Luxembourg, the Netherlands, Belgium, Spain, Portugal subsequently to the demand's for establishing sovereignty on the Antarctic continent, while in the territory of the future Artificial atoll's in international water's and around Rockall clif in the Atlantic Ocean, and also completely legal claim's of sovereignty in the area of ​​territory about the size of several galaxy, roughly 15,000,000,000.000 planets in the Universe through special technologies of government The Imperium of Diamond's and also again in a special space civilization station's in free space. The World Diamond territories are managed as a free area, without any border barrier's to stop the legal movement. There are limit's only for blocking organized crime, and therefore also against not-identification movement or threatening movement's against security and system. The territories are becoming the center of world political, economic and trade and social and political movement's.